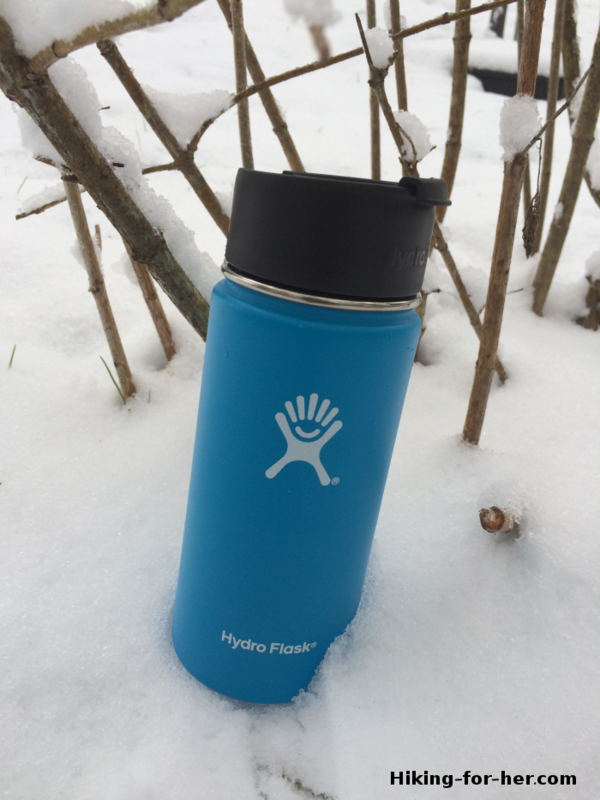 This Hydroflask gear review takes a look at a 16 ounce wide mouth insulated metal bottle for carrying hot beverages on a hike. Let's get the disclosures out of the way first, and then jump into answering that question. 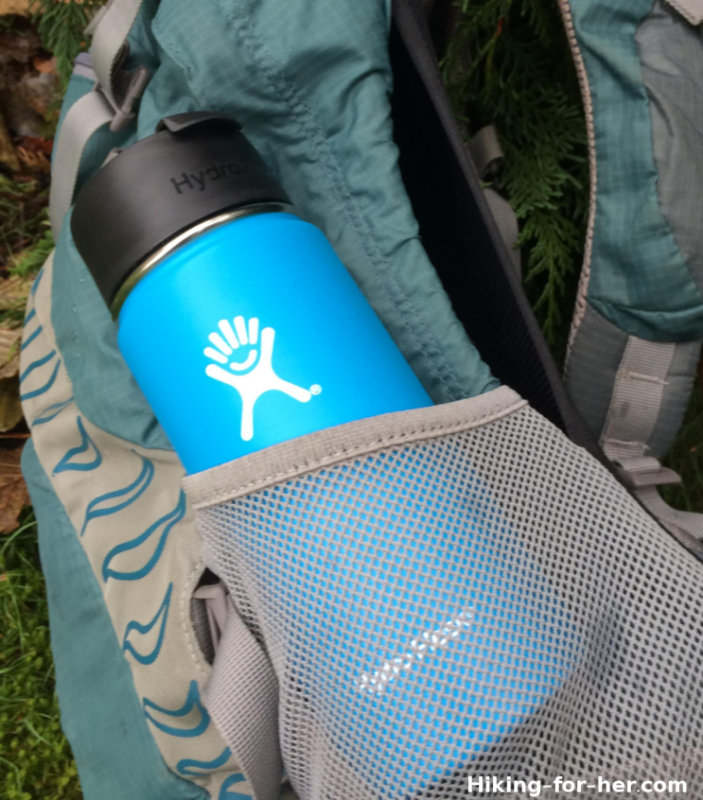 The wide mouth insulated bottle was received from Hydroflask, and the opinions, photos and comments depict Hiking For Her's experience with it. 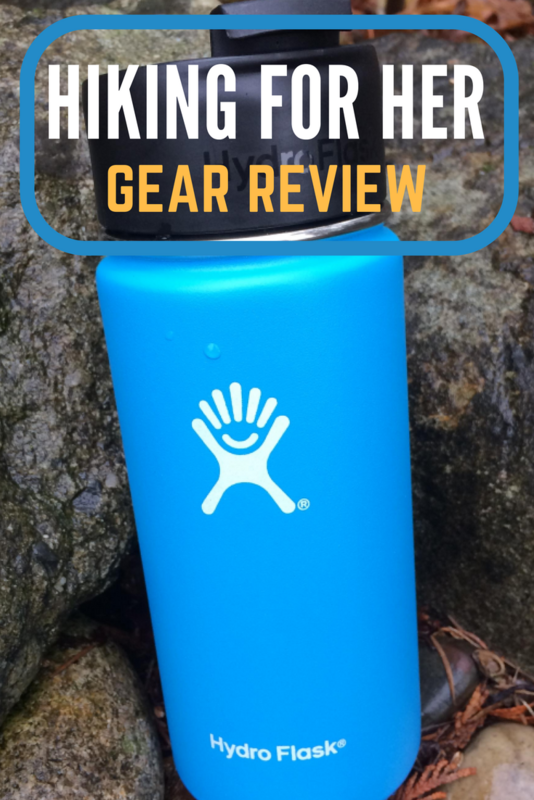 Hiking For Her wrote this Hydroflask gear review for the sole purpose of making you aware of hiking gear that performs well on the trail. 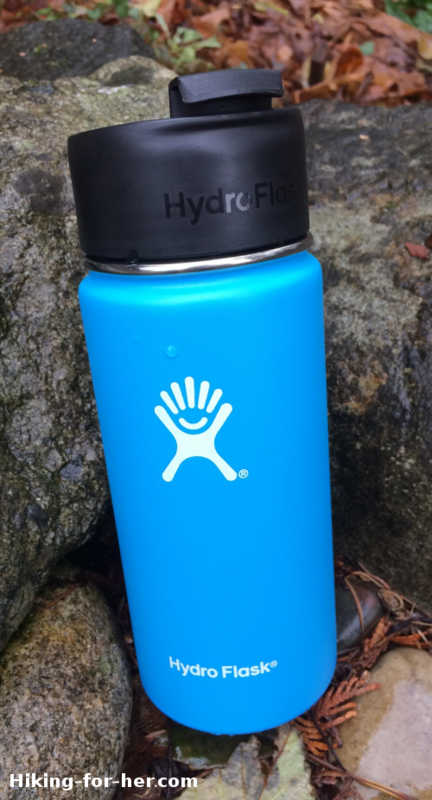 HFH is a Hydroflask affiliate. If you purchase these insulated bottles through this link, a small percentage of the purchase price is received by HFH - yet you pay nothing extra. Only the best gear makes it onto the HFH affiliate list. 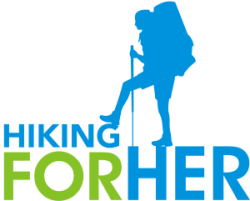 This keeps abundant free hiking tips flowing your way, while putting great gear into your hands. Now, on to the facts! They say first impressions count, and that's as true for hiking gear as it is for anything else in life. The attractive color and pleasantly textured surface of this wide mouth insulated bottle makes for a great first impression. The 16 ounce bottle is wide, but not too wide to fit comfortably into your hand. The flip up lid seems sturdy, built to stand up to many open/close cycles on the trail. And it's lightweight when empty, just waiting to transport a hot beverage on a snowshoe hike. How long will a hot beverage stay hot in this bottle? Part of that question is answered with another question: What is this bottle made of? You might be a coffee drinker, wondering if this insulated bottle will keep your brew piping hot for your first rest break on the trail. Me? I'm a chocolate almond milk drinker when I hike. I love the combo of carbohydrates and protein, and the smooth chocolately taste of it on my tongue. So this review will focus on that particular beverage. I've been around insulated bottles enough to know that pre-heating them works in your favor hours later when you want to sip your beverage while perched on a snow pile. So that's what I did: poured boiling water into the flask, and let it sit for a few minutes (I didn't time it, but estimate it as around 5 minutes). I emptied the hot water out, then filled the Hydroflask with my hot almond milk. The cap screwed on quickly, and due to the rubber O ring, sat solidly on top of the flask. The flip lid clicked down tight. A quick little inversion test (tipped it upside down and rock it back & forth a few times), and I popped the bottle into an outside side pocket of my backpack. Why not put it in the warmer, deeper bowels of my backpack, perhaps encased in an old heavy winter sock? 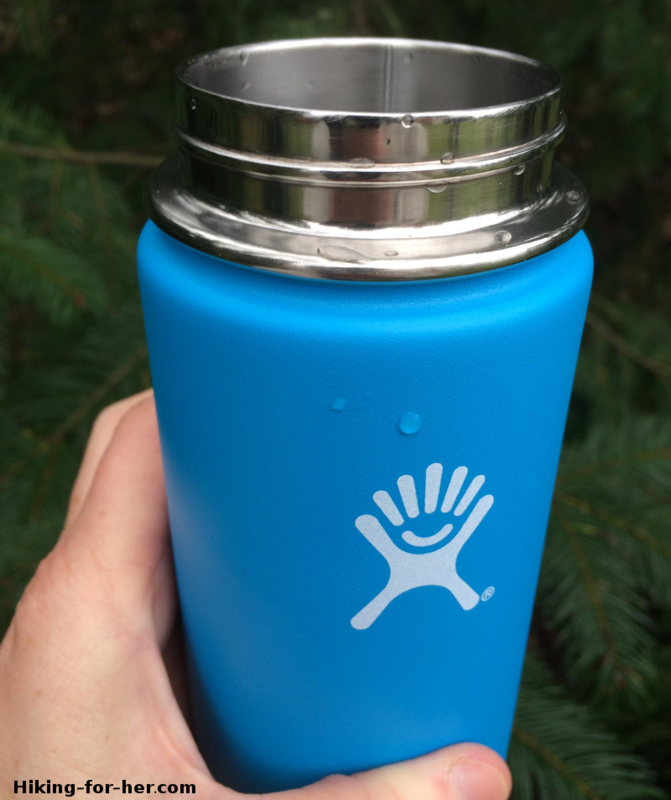 Because I wanted a Hydroflask gear review "worst case scenario" for you, dear reader. If the Hydroflask could take an hour+ of riding in back of the Jeep to the trail head, and then exposure to the 35F weather on the trail for several hours, that would be a fair test of its insulating abilities. I put the Hydroflask in the snow for 15 minutes (I timed this interval) before popping up the lid. I usually carry small cups for myself and my husband, so I didn't try to drink directly out of the bottle. Instead, we poured some of the hot almond milk into our cups, roughly half of what was in the bottle divided into two portions. And here's the thing: It was too hot to drink!! Yup, the bottle kept the beverage at a temperature that needed to cool down a bit before swallowing, even in a chilly environment. I've used other metal insulated bottles before, and they went through the same testing process but with less than stellar results. So it's Hydroflask from now on for me, to ensure hot chocolately goodness for my cold weather hiking plans. We downed the rest of the almond milk back at the trail head, approximately 6 hours after we started the hike and roughly 7 hours after filling the flask. While not super hot, the almond milk was what I would classify as warm enough to sip slowly. Fluid will form a small pool on the surface of the lid after you pour, if you're not careful, so be sure to slurp it all off after each pour (or wipe it off, if you're meticulous). And I'd be careful when opening any lid on a bottle which contains hot fluid - be prepared for a splash or splatter effect. If you've got gloves on, no worries. "The Hydro Flip Lid (pictured in this review) is not leak proof." Also, you may be wondering what would happen if I didn't pre-heat the flask. Wonder away, because I'm on to a good thing and I'm not willing to arrive at my lunch spot in the middle of the woods without something hot and delicious to drink. I have nothing to report about how the coating on this bottle held up to being dropped or scratched, as I had a firm grip on it and wasn't really willing to toss it at the rock piles we passed on the way up to the snow zone. But I did take a few photos! For now, admire the beautiful powder coated finish on this bottle. I love the way this flask feels, compared with my other polished metal bottles. The texture gives me confidence in handling it with wet or cold (wet AND cold, more like it) fingers. I tested how hard it would be to remove the lid without gloves, and didn't have a problem. I also handled the flask wearing fleece gloves, and didn't find it hard to pull it out of my pack or pop up the lid with gloved fingers. And this metal bottle didn't feel extremely cold in my bare hands, probably due to the powder coating that gives it texture. Note: This textured coating should also prevent the bottle from sweating (beads of moisture on the outside) if you use it for cold beverages (fill it with ice in preparation for a hot hike, maybe). The bright blue color was cheerful and who knows why, but it made me smile whenever I saw it. Straying a bit beyond this Hydroflask gear review for hikers, I can definitely see this insulated bottle going places beyond the hiking trail. And looking good while being in "stealth" hiking gear mode. If you've ever tried to get a good cup of tea, or a freshly brewed, palatable cup of coffee on an air plane, you know where I'm going with this. Hit the coffee stand before you board! And think of the disposable cups you'll be keeping out of the landfill. 12 ounce and 20 ounce bottles are also available, so you can carry coffee, tea or a hot toddy (!) in various amounts. They donate 5% of the net proceeds from each purchase (~$25 US for this bottle) to a social cause of your choice. Use the serial number, plainly printed on the back of the label to get started. And here's even more to love about this company, beginning in 2017. They plan to award cash grants and donations to non-profit organizations which build, maintain and restore parks. Hurrah! Save our outdoor space by supporting this company. I have a hunch that drinking directly out of the flask would be problematic if you had a hot beverage inside. While the lid has a small-ish opening, and you can fold the top part back out of the way of your mouth, it still bumped my nose as I was pretending to take a drink (I'm a pour-er, remember?). Hence, the name "flip lid". But maybe I'm too cautious with hot beverages. If you have a small, perky little nose, this might not be a problem for you. Also, I wonder what would happen if the O ring pops out without me noticing. Hot sticky chocolate messes in my backpack are not something I look forward to. So I will be sure to check for the presence of that all important sealing ring every time I remove the lid. Note: There's another type of lid you can purchase for this wide mouth bottle, what they call a "wide mouth straw lid". This option won't work for me, because I share my hot beverages and pour them into cups. But it might be a good option for you to consider if you like to drink from straws (a grown up version of a sippy cup). I do a lot of winter hiking, along with cold weather hiking in alpine terrain. I also love to stop for second lunch, resting for a few minutes with something hot in my hands. The hot steam washing around my mouth, the tempting smell of chocolately deliciousness, and the knowledge that I'm hydrating and nourishing my body just makes a cold hike better. If you're into backpacking tea, this is also a perfect way to brew some for a bed time ritual. And I'm here to say that Hydroflask has a great solution for how to keep things hot in a cold environment, up to 6 hours (the time limit of my little trail test). Or cold on a hot hike! This wide mouth bottle would also be a great gift for non-hikers, maybe with a sack of coffee beans tucked inside? Or some personalized blend of hot chocolate: milk, dark, white, you know what I mean! 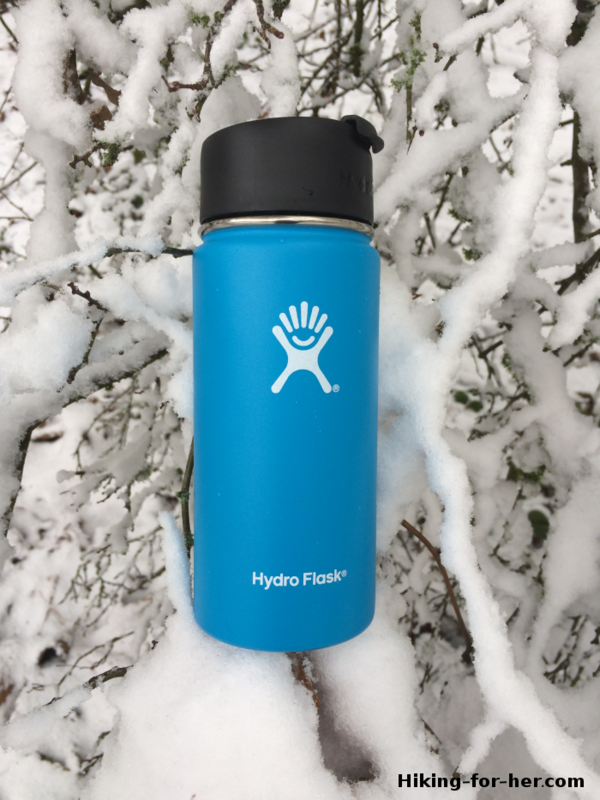 And for your friends who are focused on environmental and social causes, the durable, reusable bottle along with the chance to donate to a favorite cause and support open spaces makes a Hydroflask a great gift. And you even have options for personalized color combos, which is such a nice touch, don't you think? If your gift recipient has a favorite sports team or signature colors, you can really amaze them with a unique Hydroflask. Get started with your selections here. If you'd like more details about how I used this Hydroflask, I'd be happy to answer your questions. Just use the CONTACT link at the top left of this page, or the Ask A Question link below. Because I'm serious when I say the Hiking For Her website is all about getting the best gear into your hands. This wide mouth insulated bottle is a great addition to my gear locker, and I hope it will be for yours as well.